The 39th anniversary of Roe v Wade – the decision on abortion rights by the United States Supreme Court – is January 22. This week, we will publish a series of articles on different issues surrounding the decision. Back alley abortions and women trying to abort on their own had been a fact of life for a very long time. Roe v Wade didn’t start the controversy about abortion, but it brought it into the realm of politics. There will be many articles written today and this week concerning the decision. “On The Issues Magazine” has devoted its Winter 2012 issue to the subject of abortion. Read it here. There will be marches in support of the right to choose abortion. There will be counter-marches by anti-abortion groups. The first marches began shortly after the decision. Abortion – Roe v. Wade linked control of reproductive rights to a woman’s constitutionally guaranteed rights to privacy. To social conservatives, this upset gender roles and traditional patriarchy, and was considered an attack on “the right of a husband to protect the life of the child he fathered in his wife’s womb.” Read more here. 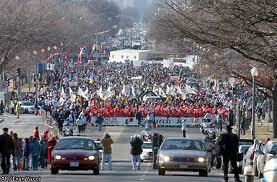 The annual marches in Washington, DC are considered a “Festival and Special Event” by About.com. Listed between “Home and Remodeling Show” and “Bethesda Chevy Chase Restaurant Week,” the information about the rallies includes directions to the Supreme Court and the National Mall. Tourists can view the expected 250,000 or more demonstrators for both sides as part of their visit to Washington. We worry a little that listing this in a guide about Washington might trivialize the importance of the decision. Might make the struggle to protect the right to abortion under all circumstances without stigmatization seem like a festival for fun. 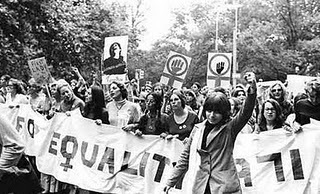 If it adds to the crowds lending their voice for the rights of women, it helps. If it becomes a spectacle, an event for entertainment, it doesn’t help. This anniversary is historically the most important step forward for women’s bodily autonomy . There is so much work still to do. I’ve never participated in a march in support of abortion. But I was 16 when Roe v Wade passed, and I can remember how exciting a time it was. The year before that, six of the young women in my junior year of high school had left school because they were pregnant. Back then, the only legal choice was to have the baby. You could get married, or you could put it up for adoption. Very few people chose to raise the child alone. I knew of six girls in my class who got pregnant that year. There may have been others who managed to get a “back-alley” abortion, or whose parents had the means to take them out of state for a legal abortion. Some of the girls I knew got married, child brides at 15, some of them didn’t. Most of them, I never saw again. And of course, I don’t know what any of them would have chosen back in those days. But when Roe v Wade passed the next year, we knew it opened doors that had been nearly closed up until then. Roe vs Wade was decided when I was 23. Even though birth control pills were available in the early 1960s, there were state laws prohibiting the distribution until a Supreme Court ruling in 1965 stated that these laws violated the “right to marital privacy.” (Griswold vs Connecticut). That made it possible for married couples to obtain prescriptions for birth control pills without restrictions. It wasn’t until 1972 that unmarried couples were included in this right. (Eisenstadt vs Baird) I was also 23 when that decision came down from the Supreme Court. Some states still have restrictive laws for the distribution of birth control to unmarried minors. In real-life terms, that means: For all of my teenage years, the only birth control available for most single women was abstinence, rhythm method, douches or condoms. Needless to say, these were not 100% effective. There were a lot of unplanned teenage pregnancies. The only options were drop out of school to raise the baby, put the baby up for adoption or go to a back alley abortionist. I joined NOW and marched in support of Roe vs Wade and the equal rights amendment for women. To witness firsthand the number of young lives derailed by unplanned pregnancies made me a lifelong advocate of bodily autonomy and a feminist. The decision in Roe vs Wade was a cause for celebration. We can never go back to the way it was before. Over 50% of the population in America are women. We need the right to make the reproductive choices best for our individual lives. Abortion Support in Kentucky is celebrating Roe vs Wade with their donation drive towards efforts to make abortion and reproductive healthcare more accessible in Kentucky. Please visit their website and contribute whatever you can. This entry was posted in abortion, Anti-Choice protesters, Blog For Choice, Louiville Ky, pro-access, pro-choice, Reproductive Justice, reproductive rights and tagged abortion, Access, anti-abortion, buffer zone laws, clinic, harassment, Louisville KY, Roe v. Wade, sexual and reproductive justice by Servalbear. Bookmark the permalink.